In the modern world, there is no functioning company that would not think of increasing security in harmony with the development of their main product portfolio. 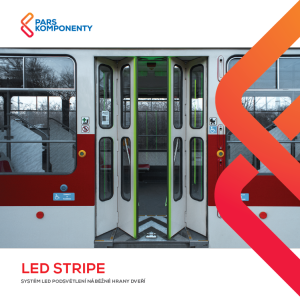 Pars Komponenty is not an exception also, of which security element, the LED STRIPE LED has gained its name after a year of trial operation in City of Prague and is a simply and cheap design solution for increasing safety in many cities and on lines around the world. The LED Stripe meets the requirements for rolling stock and is an appropriate complement to the design of the car in accordance with safety. The main task of LED Stripe is to alert the passenger to the state of the door system. If the doors are ready to open, go open or open, the LED Stripe lights up green. If the door is closed, the light is red and the car’s driving time is turned off.